After reading through this magnificent and insightful book, one can easily enter into a state of wonder and bask in the glow of having been exhilarated and enriched by encountering the rich offering of a welcoming master. But this is not what Robert Bellah (1927 – 2013) wanted us to do – instead he invites us into an ongoing and deepening conversation, a conversation where one does not return to the reality of one’s discipline or even the messiness of everyday life with the same eyes and following the same routine, but challenged and motivated to use these eyes to see and perceive things in a vastly different manner. This is evident in his comments on Aristotle and Plato, where he says that “[m]ost remarkably, instead of being overwhelmed by his predecessor, … Aristotle was able calmly to look around the new world that Plato had opened up and explore its many possibilities, without rancor, though certainly not evading a good argument when he needed one.” (pp. 395 – 396). We are called to be in this position – learning, studying, interacting, interrogating, arguing, and through all this being enlivened and enriched. 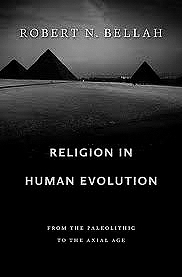 To get back to our “welcoming master”: Listen to him in one of the evocative footnotes that makes the reading of this book such a pleasure: Talking about cosmic history, he refers to some important books and also to websites that he has checked to see if what was said in the books had been superseded. He goes on “Most of cosmic history is so staggering in terms of time, size, speed, and heat as to tax my imagination, so I can only recount what I barely understand.” (p. 620, n. 14) – the master who barely understands, which, in my opinion, is a sign of a true master, someone who invites you to think along with him. This thinking cuts across generations, across time, across cultures, and even across space. Talking about one of the maxims of Marcus Aurelius’ Meditations, he concedes: “I might also note that Marcus’s comments are a rebuke to my earlier comment on the cheerlessness of the cosmic metanarrative.” (p. 621, n. 22) Well, what we have in this book a certainly a metanarrative filled with exquisite details, with meticulous unpacking of texts and contexts, with people and places coming alive, with dangling and tantalizing questions that offer a fertile field for further investigation and a work that has enlivened the discourse on religion and human life immensely. True, a metanarrative, but in his words, a book that “is awash in a sea of stories” (p. 45), a book that “is a history of histories, and a story of stories” many of which have been made a part of his story, and through this offered to us to enter into as our story. In that sense his take on ancient Israel, Greece, China, and India, are as much a part of our common narratives into which we are offered an invitation and entrée. And so briefly, to India, a place and an area that Bellah is only too quick to point out is something with which he entered into “with more than a little trepidation.” In terms of the present, after a visit to India, the Australian writer, David Malouf noted: “The fear of India. It comes in many forms. Fear of dirt, fear of illness, fear of people; fear of the unavoidable presence of misery; fear of a phenomenon so dense and plural that it might, in its teeming inclusiveness, swamp the soul and destroy our certainty that the world is there to be read but is also readable.” (In his, “A Foot in the Stream,” in 12 Edmondstone Street (London: Penguin Books, 1986), p. 105.) Can I try to reassure him by saying that even we Indians enter into a study of India with certainly more than a “little trepidation”? After having read and reread this chapter, all I can say is that the insights and strategies of reading, as well as the choice of texts to be highlighted and the issues that emerge all point to Bellah as someone whom you would like to have as a key member of the group guiding you through this wondrous and wounded civilization. Given that my task of any review is also to continue and foster engagement with the work in question, and given that I have spoken so much about the seriousness with which Bellah takes the lives of common, ordinary, people seriously, I would like to state that the ongoing questions that we wrestle with in India are questions relating to the 15 or more percent of people labeled outcaste and untouchable, those who are victims of the impact of the caste system, coming out on the side of pollution, in the purity and pollution debate, those whom the so-called great texts relegate to being outside the margins, unworthy of even hearing them and certainly incapable of understanding them, those whom whose position some of the “great texts” legitimized in religious terms as belonging to the fundamental disjointed and hierarchical nature of human society and human religion. The persistence of poverty and caste in India, leads us to ask about a context where karma, fatalism and resignation seem to persist along with unbridled capitalism, resulting in the continuation of the glaring and unrelenting contradictions in Indian society. How do we continue to deal with the degrading effects of pollution and ongoing legitimation of purity, where inter-dining and inter-marriage are still rare? The contribution of certain aspects of the Indian philosophical tradition, which saw and affirmed the reality of the divine in each person, in each thing, must be seen in interaction with other strands of the philosophical tradition which cruelly and systematically denied value and worth to vast sections of the population, especially the Dalits, seeing only karma in operation in the squalor and hopelessness to which they had been condemned by their own fate and deeds in previous births. Unquestioning submission to this harsh reality and absolute obedience to the existing social order and expectation was the price to be paid by those who could utilize the realties of the present as a springboard into a “better” future in a future lifetime. We need to learn from Bellah, as one who offers a new way of seeing and doing, a new way of drawing away from all theories of predestination and condemnation to a possibility of recognizing that the ones who have been pushed aside, the ones who are the victims of the carefully and elaborately drawn up social and economic systems, have been pushed aside precisely because their presence and labour is indispensable in sustaining these systems, including bearing the weighty burden of the “benefits” of globalization. In and through reading, digesting, and now internalizing the insights of this magisterial work, we have a moment of pause, and recollect our ongoing task of being public intellectuals, to continue to offer comfort and restitution to those discarded on the way, and offer a corrective and a sustained interrogation of those who would hurry along with and be borne along on the tide of consumerism and profitability, where countless of our fellow human beings are reduced to being the discardable byproducts of our globalized society across the world.